Don Hardy and Dana Nachman,who spent over two years directing “Pick of the Litter,” succeed beautifully in capturing key moments; those times when Labrador Retrievers are officially handed over to people who are either totally without sight or without peripheral vision. At the same time that these fantastic animals change hands, there is heartbreak in the homes of people who have raised them since puppyhood, understanding that they must fulfill their part of the bargain in losing them. 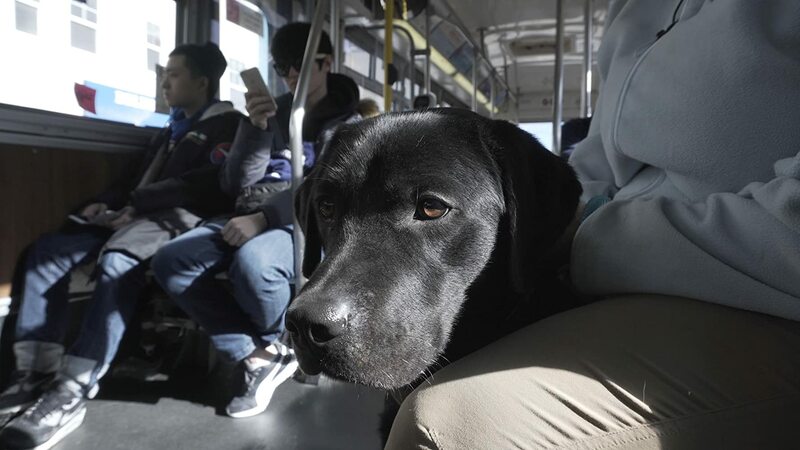 At the same time they feel gratification that largely as a result of the training they give to the seeing-eye dogs, the animals are going to be indispensable to up to 1100 sight-disabled people who apply annually to the organization for them. Unhappily, many dogs fail, even after retests; I believe out of the stars focused on here—Primrose, Poppet, Potomac, Phil and Patriot, only one or two make the cut. Phil is judged to be perfect. Those who fail are either returned to the raisers or serve in another capacity such as animals for diabetics of veterans with PTSD. It’s a pleasure to witness ecstasy when a dog is handed over to a blind person. Ron, for example, a man who lost sight in both his eyes from a genetic disease that skips some generations, reports having butterflies, as nervous as he would be when meeting a blind date. I would like to know what happens to dogs when because of age, they are no longer able to service their people. Is there a sanctuary available? Do they go back to the building that houses them? All in all, America’s Best Friend is given the equivalent of a 21-gun salute by this well-crafted documentary.